London, UK – Computer software developers Apt Projects Ltd, owners of the online TCM Big App Store, have been making public what they believe is a misuse of process by Apple Inc. Apt say that Apple are opposing Apt’s trademark registration of TCM Big App Store for no valid reason. Apple have the UK and EU trademarks for ‘App Store’ and claim that the public could be confused between their App Store and the TCM Big App Store. Apt Projects say that the TCM Big App Store does not sell phone apps, it sells TCM Big Apps which are for use on PCs and Servers and which have been developed using their TCM software development kit. They also say that their zany, quirky branding is completely different from Apple’s App Store branding. Apt Projects Ltd want this news heard in the US as well as the UK since Apple is a US company and it would be normal to make their press release available in the US. Last week Apt made available for distribution a press release concerning Apple’s opposition to their trademark application for the TCM Big App Store. This was accepted by newswire services in the UK and Australia but they were stunned to find that it was it rejected by a US newswire service. On being pressed for a reason Apt’s US agent reported that the US wire service to which their press release had been submitted had told him “Unfortunately they (the wire service) are not willing to distribute this release in any form, I asked them what needed to be tweaked but they were not willing to touch it at all saying that you should speak to a lawyer.” . “It’s an indication of the uphill task that we face in defending ourselves from being steamrollered by Apple over our trademark Application. It should be noted that Apple have recently trademarked the specific layout and appearance of their retail stores, that’s fine, they have established their brand in that way. But they haven’t trademarked the appearance of their on-line App Store, it’s just another webstore. In releasing this press release, Apt Projects Ltd hope to reach out to people who believe that the market should be shared by companies willing to properly accept a bit of healthy competition and not one that is dominated by superpowers who are willing to bulldoze whatever is in their way and suppress innovation and variety. TCM Big Apps are business management software solutions designed for specific types of businesses which run on PCs or server networks. They make life easier by simplifying and automating many of the clerical tasks which are a drag on productivity. TCM Big Apps are full of clever time saving and easy to use functions which remove work from the user and provide great reports. Examples would be CRM and sales force automation, or a system for a sports club or equipment hire, or tradesman type businesses – plumbers, heating engineers and the like. 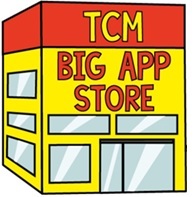 The TCM Big App Store is the only virtual on line 12 floor, 7 acre 700 counter department store. It has lifts and escalators and stairs to move you from floor to floor; Cookery and Sports Demonstration Areas, a pet shop with a rhinoceros and fish racing… it’s a zany marketing approach and we invite additions to the Story of the Store which records the history of this virtual building which has the address ‘Kingsbridge, Central London’.